“Wait, let’s take a picture!” Osama Zeid al Homran shouted to his friends. In the video the boys, aged six to eleven, are laughing and joking with one another on the bus on the way to an excursion to celebrate the end of term at their school in Sa’dah, a region of Yemen bordering on Saudi Arabia. Hours later, Osama and at least 24 of his classmates would be dead. The bomb which killed them when it struck their school bus was a GBU-12 Paveway II, made in Garland, Texas, and sold to Saudi Arabia by Lockheed Martin in a deal approved by the US State Department. Of the 51 people who died in the bombing on 9 August, 40 were children. UN human rights experts estimate that at least 16,706 civilians have been killed in the Saudi-led coalition’s war in Yemen since 2015, but believe that the true number may be far higher. The majority of civilian deaths have been the result of airstrikes, including repeated strikes in residential areas and densely populated public spaces such as civilian marketplaces. In a recent report, the UN Group of Regional and International Eminent Experts on Yemen found that the actions of Saudi Arabia and its partners in Yemen may amount to war crimes. For years, human rights advocates around the world have been calling on governments to ban arms sales to Saudi Arabia. By and large these calls have fallen flat. Saudi Arabia was the world’s second largest arms importer in 2017, with a total military expenditure topping US$69 billion including 10% of total global arms imports, according to the Stockholm International Peace Research Institute (SIPRI). Although a handful of countries, including Norway, Belgium, and Finland, have moved to block or at least pause the sale of weapons to Saudi Arabia and its coalition partner the United Arab Emirates over the conflict in Yemen, many others including Australia have shown no such hesitation. Yet in recent weeks another violent killing – that of Saudi journalist Jamal Khashoggi – has sparked fresh debate about the role of Western governments in supporting the Saudi military machine. Khashoggi’s mysterious death in the Saudi Arabian embassy in Turkey has prompted Germany to suspend (although not permanently halt) arms sales to the Kingdom. Chancellor Angela Merkel told journalists that the matter needed to be “cleared up and those responsible held to account”, and that new weapons sales would not be approved until further notice. Members of the European Parliament have backed Germany’s stance, voting in a non-binding resolution for a unified EU-wide arms embargo on Saudi Arabia. It is worth noting that Khashoggi himself was not a critic of the war in Yemen – quite the opposite, he had spoken publicly in defence of Saudi Arabia’s use of cluster bombs in Yemen, claiming that they were not used on civilians. Assessment of all defence export applications take into account our international obligations, human rights, national security, regional security and foreign policy. Riyadh has made it clear that if trading partners want to use arms deals as political leverage – well, two can play at that game. When reports emerged in the media in August that Spain was considering halting the sale of 400 laser-guided missiles to Saudi Arabia over concerns that the weapons would be used in Yemen, the reaction was immediate. Behind closed doors, Saudi Arabian officials reportedly threaten to cancel other deals with Spain, including a €1.8 billion contract to buy five Spanish-made warships. The Spanish government backed down swiftly after workers at the shipyards held public protests, blaming the entire episode on “confusion” within the Spanish defence ministry. Ultimately there are only two countries that matter when it comes to supplying Saudi Arabia’s military. Ultimately there are only two countries that matter when it comes to supplying Saudi Arabia’s military. According to SIPRI, the US alone provides 61% of Saudi Arabia’s military imports, and the UK makes up a further 23% (France comes a very distant third at 3.6%). Without their involvement, the effect of any arms embargo on Saudi Arabia will be purely symbolic. US Secretary of State Mike Pompeo and Defense Secretary Jim Mattis have both called for a ceasefire in Yemen within 30 days, including stopping coalition airstrikes. Neither, however, gave any indication that US policy on arms exports is likely to change. Supporters of ongoing arms sales to Saudi Arabia do not deny that Western weapons are being used in Yemen, and have resulted in the deaths of civilians. They argue, however, that the alternative would be worse – that by providing Saudi Arabia with the most precise targeted weaponry, best intelligence and best training, the West is actually helping to minimise civilian deaths in Yemen. “I believe we should be part of [supporting the Saudi coalition] only because it reduces the likelihood that children will be killed. And it reduces the likelihood that this war will extend. That doesn't mean children won’t be killed through mistakes. It doesn’t mean that this war won't last for a very long time,” said Norman Roule, former CIA National Intelligence Manager for Iran. But I do believe if we pull out our support from the kingdom, we just raised the likelihood of civilian casualties. I confess I don't know why that is lost on some of the players who are involved. But again, I support our continued military assistance to the kingdom for that reason. Opponents reject this line of reasoning. The UK-based Campaign Against Arms Trade (CAAT) argues that the continued engagement with Saudi Arabia’s military makes Britain complicit in violations of international humanitarian law, including potential war crimes. 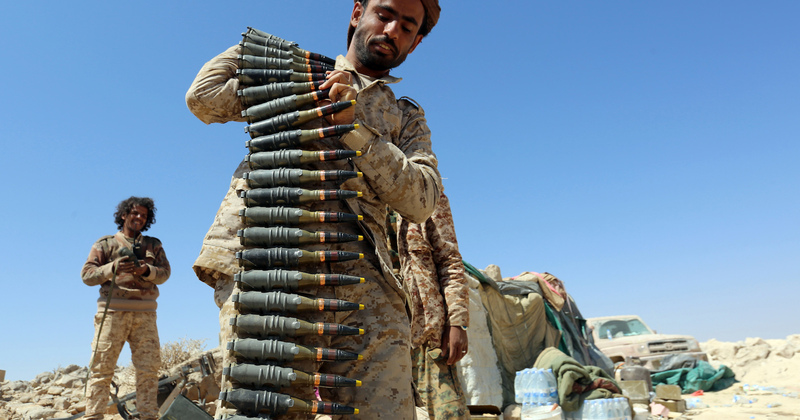 CAAT, which is challenging the weapons trade with Saudi Arabia in the UK’s High Court, describes the arms sales as both immoral and illegal under UK law, which prohibits export licenses being granted if “there is a clear risk that the items might be used in the commission of a serious violation of international humanitarian law”. A degree of willingness to, allegedly, bend the rules to support arms sales to Saudi Arabia far predates the current generation of leaders. Both the Bush and Obama administrations passed special waivers to create a legislative loophole to give Saudi Arabia discounts on training from the US Department of Defence, while Tony Blair (in)famously personally pressured investigators behind the scenes to halt an investigation by the Serious Fraud Office into dealings between BAE and Saudi Arabia. The influence of Saudi Arabia over the Trump administration has been the subject of much speculation. President Donald Trump’s first foreign visit was to Riyadh, which (in between the infamous orb-touching and sword-dancing) included announcing a planned $110 billion in arms sales. The actual details of the deal are much more nebulous – CNN says that Saudi Arabia has only actually committed to $14.5 billion in purchases so far – but the headline numbers have clearly stuck strongly in the mind of the President. [W]e have $450 billion, $110 billion of which is a military order, but this is equipment and various things ordered from Saudi Arabia, $450 billion. I think it’s over a million jobs. That’s not helpful for us to cancel an order like that. That hurts us far more than it hurts them. According to Politifact, none of these claims are accurate, but they are nonetheless enlightening. While it is true that Washington views Saudi Arabia as a key security ally in the Middle East, the strong support for the arms trade with Saudi Arabia in both the US and the UK has as much if not more to do with domestic pressures as with international security and diplomacy. Saudi Arabia is the United States’ single biggest export market for arms, making up 18% of total US arms exports and spending a reported US$5.5 billion on weapons systems and services from US contractors in 2017 alone. Its biggest suppliers include Boeing, General Dynamics, Raytheon, and Lockheed Martin, each of which has individually made billions in not only weapons sales, but also ongoing contracts for maintenance, training and other services to Saudi Arabia over the past five years. I tell you what I don't want to do. Boeing, Lockheed, Raytheon, all these companies ­– I don’t want to hurt jobs. I don’t want to lose an order like that. British Prime Minister Theresa May has also rejected calls to suspend arms sales to Saudi Arabia in response to Khashoggi’s death. When questioned in parliament, May said that “the procedures we follow are amongst the strictest in the world”, and pointed out that Britain is the third largest contributor to humanitarian relief efforts in Yemen (the fact that she felt the need to mention this is interesting in itself, raising the question of whether, at least to May’s mind, the two issues are connected or that one might somehow make up for the other). The reality is that for all the sturm und drang over Khashoggi’s death, it is unlikely to make any significant difference to the Saudi’s relationships with major weapons suppliers around the world. Not even the Germans are proposing to permanently halt arms sales, only to institute a temporary pause. And behind and above it all looms perhaps an even bleaker truth – the fact that the current debate isn’t really about Osama Zeid al Homran, the boy who wanted his friends to stand still for a photograph on their school excursion. It’s not about Khaled ‘Odah, who had his leg amputated after a Saudi airstrike on the market where he was selling vegetables. It’s not about three year old Nabil, or his infant sister Sumood, who died when their home was bombed in September. It’s not about the bride who was killed on her wedding day, or the families struck down as they tried to bury their loved ones, or any of the other over sixteen thousand people whose names and faces will never make it into the international media. Whatever happened to Jamal Khashoggi was unquestionably a crime and a tragedy. It is, however, a painful reminder of the selective nature of international outrage that the death of a single, well-connected Saudi Arabian journalist was able to spark a conversation which the deaths of thousands of Yemeni civilians could not.